Just in: from a National Weather Service report on 9/11 tracking Hurricane Florence (unintentional phallicity); and gift bottles for the Italian liqueur Limoncello (pointedly intentional phallicity). The makers could claim that the middle bottle just had a lemon as a stopper, but the bottle on the right is flat-out intentionally outrageous. Limoncello … is an Italian lemon liqueur mainly produced in Southern Italy, especially in the region around the Gulf of Naples, the Sorrentine Peninsula and the coast of Amalfi, and islands of Procida, Ischia, and Capri. It is also produced in Calabria, Abruzzo, Basilicata, Apulia, Sicily, Sardinia, Liguria, Menton in France, and the Maltese island of Gozo. In northern Italy, the liqueur is often referred to instead as limoncino. It is also a popular homemade liqueur, with various recipes available online and in print. Traditionally, limoncello is made from the zest of Femminello St. Teresa lemons, also known as Sorrento or Sfusato lemons. Lemon zest, or peels without the pith, is steeped in rectified spirit (most commonly grappa [‘a brandy distilled from the fermented residue of grapes after they have been pressed in winemaking’ (NOAD)], but vodka may also be used) until the oil is released. The resulting yellow liquid is then mixed with simple syrup. Varying the sugar-to-water ratio and the temperature affects the clarity, viscosity, and flavor. 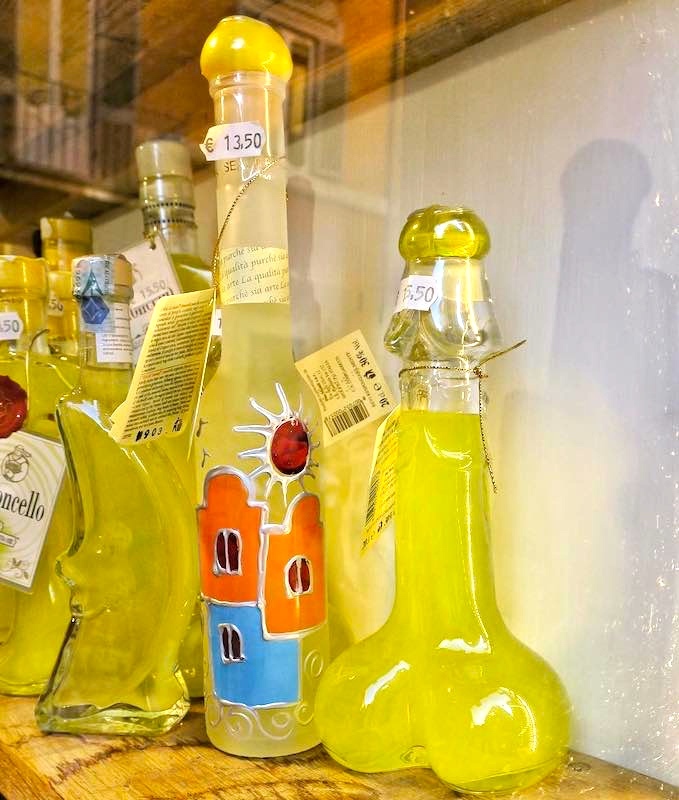 Opaque limoncellos are the result of spontaneous emulsification (otherwise known as the ouzo effect) of the sugar syrup and extracted lemon oils. The limoncello I’ve had was intensely sweet and had the kick of a mule, but obviously there’s a lot of variation. This entry was posted on September 14, 2018 at 5:13 pm and is filed under Language and plants, Phallicity. You can follow any responses to this entry through the RSS 2.0 feed. You can leave a response, or trackback from your own site.